The card above is what JJ made for my mum for mother’s day. There are some mother’s day crafts hidden around the house that JJ made at after school care and school. He’s really excited about it. He’s also not been backward in coming forward in telling me how I could improve my parenting. We all need feedback right? If you’ve read my last post I copied out what he’d written to me not knowing then that it was meant to be for mother’s day. Friday night was my saviour. I got to go out and be an adult. I dropped JJ off at the overnight babysitter’s and came back to my house where my two girlfriends were cooking nachos and a glass of sparkling red was awaiting. We then went to see a friend’s band and The Kill Devil Hills from Perth. It was the perfect night out for me getting to see live music. I was sitting down for the second band and I ended up getting up to dance. They were great. So great I bought a CD and got the six of them to sign it for me. It’s only a day or so since I got the CD but I’ve already listened to it at least five times. I’m a bit like a kid with the latest Wiggles video. I said Friday night was my saviour. I must have really needed a night out to let off some steam because despite being a bit tired the next morning I had a fabulous day. JJ was a dream. We chatted about my parenting and about how he responds to that and I think we reached an understanding and a truce! I felt so good and had so much energy I blogged, twittered (see right hand side of my blog), took photos (to come), cleaned my room and a cleaned out a couple of my drawers, changed my bed’s sheets, did housework, washed and hung out two loads of washing, cooked dinner, washed dishes, mowed the lawn, filled up the big wheelie bin with cuttings, walked the dog and the kid, and hired a couple of DVDs. I think I must have been in a slump for a while now because I haven’t felt as good for some time. Welcome to my world as a mother. Happy mother’s day to me and to all the other mother’s out there (especially my own). Good lord! That card is a work of genius! 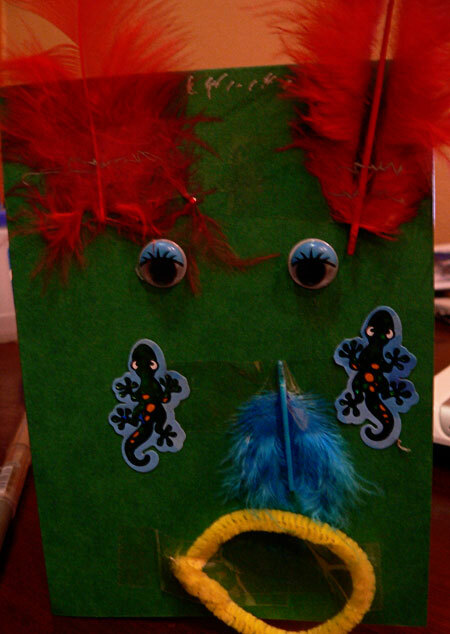 I love the way the pipecleaner mouth means that you can change the expression on the face…joy! fury! suprise! smug! with just a twist of the fingers. Hey just wandered onto here from misc aussie mum, I seem to be suddenly discovering a whole ton of great Aussie Mum blogs just now even tho I’ve been blogging for a couple of years. Hope your Mothers Day was truly lovely. What a great mother’s day weekend! It is the moments of joy that make it more than worthwhile. Stacie, I did have a good mother’s day. My son even said at the end that he hoped I’d had a good day, and that he’d had a good day. OvaGirl, I never thought of changing the pipe cleaner mouth’s shape. I’ll have to tell my mum that. My mother’s day was truly lovely. Thankyou. Jeanie, thanks. The moments of joy sure do help make up for the other times. Jen, happy, happy Mother’s Day. May your enthusiasm for each other continue for ever more. I hope you get more adult nights. I reckon it makes us better parents when we can go play with big people – we always tell the kids to go play with people their size so we really do need to follow our own parenting advise. May there many more reds awaiting you Jen. Gld to hear you had such a wonderful Mother’s Day and a great night out on Friday – sometimes us mothers do deserve some adult time to recharge the batteries! Thanks Megan. Yes, I should do more adult nights as it definitely helps me with the parenting thing. I’m sure many more reds await. It is wonderful you have Mummy time out and you feel like you have accomplished something good. Trish, yes it is good to have mummy time out and I think all mum’s should make a point of doing it regularly. Cheers. I’m heading out to see a band on Sunday night and am so looking forward to it. It sounds like I am a bit like you, even though you maybe tired you actually feel refreshed and contented! What band are you going to see? It’s one of my favourite things to see a good band. Apart from the fact I love the music it makes me reminisce a bit.